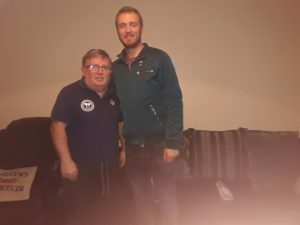 Billy O’Sullivan told Ronan Morrissey of the Waterford News & Star about struggling with confidence as a child, his sporting life and the Press Gang’s unlikely success on stage. IT CAN be difficult to link Billy O’Sullivan with the youngster he once was. A well-known Waterford face, he has been involved with martial arts for around 40 years and in addition to running the School of Kickboxing in his name, he conducts a street awareness programme in St Angela’s and gives free self-defence classes. Back in the day, however, he was a keen follower of fashion, donning suede jackets, dapper suits, and bell bottoms – comically bragging that he was the first man in Waterford to buy a pair of the flared pants from Fitzgeralds. “I laugh at myself every day,” the 68-year-old says with a smirk. Billy was born on Browne’s Lane, around the corner from his Closegate home, at a time when people had nothing but each other. A stew cooked in one home could feed two houses over a couple of days and sugar, milk and butter changed ownership freely. His Dad worked on building sites, spending time in England, while his mother Maggie May grew up in the soldiers’ houses at Rathfadden Villas. The only boy of four children, Billy’s main childhood memories are from the Yellow Road where the O’Sullivan’s moved to. Unfortunately, he jokes, he got his height from his mother’s side and while he can joke about it now, he struggled with confidence as a child partly as a consequence of a speech stutter. As a result, school was torture – he would sometimes give the incorrect answer to questions solely because his mouth couldn’t get the right one out. “’Can I have an orange please’,” he happily said. In his teens, Billy was a member of the Press Gang, named as such because many of his friends worked as paperboys for local publications. He got a job in Coad’s shoe shop in town and while he enjoyed it, he was happier messing about with friends. The group remain close today and he says the best sign of their friendship is that when they pass each other in town they don’t always need to stop and reminisce – some days they will but on others they will merely nod at each other. Members of Our Lady’s Youth Club, he laughs that the nun and priest attached to their club both ended up leaving the church and had seven children each – “we drove them off their heads”. Crediting sport for keeping him on the straight and narrow, his first passion was football. His Dad brought him back his first leather ball and football boots and jumpers, regardless of how new, were often used for goalposts on the streets around the Yellow Road. After hanging up his boots, a friends introduced him to karate and having acquired an appreciation for martial arts, he ended up loving the physical challenges presented by kickboxing. To this day, he has helped produce around 30 World Champions in addition to European and national winners, thanking the club’s trainers. In addition to the titles, he loves helping local youngsters, who he insists will give you respect if you give them their time. As an added benefit, he can do it from the heart of the city he loves.